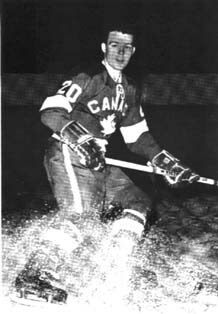 Born in Creelman, SK, he played with the Weyburn Red Wings Jrs., Canada's National Team, Queen's University and the NHL's California Seals. His coaching career began in 1977 as head coach of the University of Manitoba Bisons. He also coached Winnipeg Monarchs AAA midgets and EK Elmwood Millionaires (CASH League) and was coach of the year in 1982. He also served as MAHA assistant technical director. In Brandon, he coached youth hockey, served on the executive of the BYHA, and conducted coaching clinics. In 1991-92, he also coached the Brandon University Bobcats. The Brandon U professor and Society for International Hockey Research member has written articles for the Manitoba History journal. With historian Ed Sweeney, he wrote an essay on Manitoba hockey for the Encyclopedia of Manitoba.